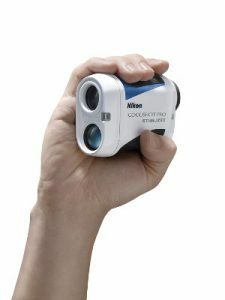 The COOLSHOT Pro Stabilized replaces the discontinued COOLSHOT 80i VR and other older slope calculating devices from Nikon’s rangefinder line such as the COOLSHOT AS. It’s only been a recent development that the USGA has allowed slope rangefinders to be used in tournaments. It’s not what it sounds like. The slope feature must be turned off during play, but only a few years ago, it was too hard to tell if the feature was actually off. Some manufacturers thought of ways around this by using colored faceplates to distinguish between distance only and slope measurements. But, Nikon has taken things up a notch. The Coolshot Pro Stabilized rangefinder doesn’t require you to tediously change out faceplates and risk losing them or being disqualified. Instead, the exterior of the rangefinder has an Actual Distance Indicator. An LED green light located in between the laser and objective lens will flash and light up when Slope ID is turned off. Everyone will be able to see and confirm that you’re in distance only mode. 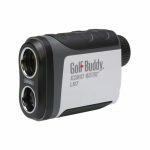 This feature really makes it convenient to own one rangefinder for all golf practices and competitions. Moving on, it’s small, lightweight, and compact – it’s literally palm-size. But, just because it’s small, it doesn’t mean it’s small on performance. How do you know you ranged the flagstick and not the trees behind it? The Coolshot Pro has locked-on technology that will tell you it ranged the closest target. The locked-on symbol will appear as a green circle around the reticle on the LED display. Speaking of LED displays, distances will show up in red. You can set your display brightness to automatically adjust with conditions, or you can manually set it to your preferences. As the name implies, this rangefinder is unlike many others on the green. It has an image stabilizing feature that can reduce movements and vibrations from unsteady hands up to 80%. Steady images mean acquiring the target and a distance reading faster, easier, and more accurately. Is there nothing the Coolshot Pro can’t do? We daresay this is the best we’ve seen from Nikon yet! How Accurate is the Nikon Stabilization Rangefinder? With distances out to 1,200 yards, there’s a lot of room for error. Nikon guarantees incredible accuracy to within +/-.75 yards within 700 yards. Beyond 700 yards, you can expect within +/-1.25 yard accuracy. The video below has a comparison of the Pro Stabilized to the new Garmin Approach Z80 and Bushnell Hybrid GPS/Laser Rangefinder with a demonstration of Nikon’s stabilization feature (skip to 2:15 to get straight to that part of the video). Is the Nikon Coolshot Waterproof? Yes! It’s not only waterproof, it’s also completely nitrogen-purged to be fog-proof. How Long does the Automatic Shut-off Take to Activate? After 8 seconds of discontinued use, the rangefinder will automatically shut down. What is the Nikon Golf Mode? Golf Mode is initially the default setting, and it measures for slope. It activates the ID technology. Can the Stabilization Feature be Turned Off? No. The stabilization will automatically be activated when you power up the rangefinder. It will automatically deactivate when it powers down. What Target Mode does the Coolshot Pro Stabilized Rangefinder Measure in? This rangefinder measures in First Target Priority Mode; it measures the closest target and ignores background terrain. How to Know it Measured in First Target Priority Mode? The Locked-On sign will appear in the display as a circle around the reticle indicating that it ranged in first target priority mode. The rangefinder will also vibrate to confirm accurate reading distance in this mode. What are the 4 Measuring Modes on the Nikon Rangefinder? You can toggle between modes to choose which best suits your round. Golf Mode offers slope adjusted distances and actual distance. Actual Distance Mode offers line of sight distance only. Horizontal distance and height mode. Actual distance and height mode. How many Brightness Levels are there? The Coolshot Pro has 6 brightness settings. The first is “A” for automatic brightness, and then levels 1 through to 5 with 5 being the brightest. How Long is the Warranty on the Nikon Coolshot Pro Stabilized? This rangefinder has a 5-year warranty with Nikon. 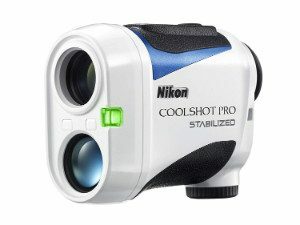 To ping up the strokes, the Nikon Coolshot Pro Stabilized laser rangefinder is expensive, but it lacks nothing. You won’t want for anything if you invest in a unit that can do it all. But, it still might be a bit much for traditional players. Nothing wrong with that, we like simplicity too, especially if it means spending less. The Nikon Coolshot 20 is budget-friendly, and as expected, it doesn’t have all the perks the Pro Stabilized has, but it has enough to get you accurately through your game. 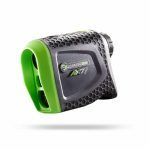 If you want a little bit more yardage and the ability to toggle through four target modes, you must swing by the Golfbuddy LR7 rangefinder. It’s nothing fancy, but it sure has some fancy features. It’s in the same budget range as the Coolshot 20, so it’s worth checking out if cash is tight. 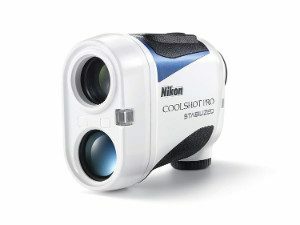 Nikon has wowed golfers with the new Coolshot Pro. The stabilization, ID, Hyper Read, Actual Distance Indicator, weather-proof, and compact size provides every reason to have to one on the green. You might not know how you played golf without one!